It is not hard to understand why President Ellen Johnson Sirleaf stressed the need for reconciliation and reconstruction, and placed emphasis on national unity as a priority during her second tenure, when she was sworn into office for a second term earlier this year; without first understanding the complex historical context and deep divisions which compounded to years of conflict that resulted in the Liberian civil war. It is a tension that goes to back to the founding years of the nation, when freed slaves from theUS, resettled in the country. However, tensions soon rise between the Americo-Liberians and indigenous people of the land due to social, economic and political divide which saw the original inhabitants of the land marginalised and relegated to the fringes of ruralLiberia. Americo-Liberians enjoyed the benefits of a bourgeoning economy inMonroviafor decades and dominated the three powerful spheres of society – political, economic and social, right down to the kind of jobs that were available to people of indigenous origins and the education they had access to. It was this cycle of discord despite attempts by William Tolbert – the last serving president from the True Wig Party, which had ruled Liberia since the freed slaves first arrived – to address the issues of inequality and marginalisation that led to the coup of April 1980, and propelled Samuel Doe, who was at the heart of the first civil war to the presidency and ended ‘133 years of Americo-Liberian ascendency.’ Liberians welcomed the change in government, unknown to the populace; Doe, who was from the Khran ethnic community, would turn out to be a tyrant, who ruled along the lines of tribalism, dividing the people more than the unity they had hoped for. This was not helped by the fact that Doe had the support of the US government, to whom he had become an ally during the Cold War era, and thus, the Reagan and Bush administrations, turned a blind eye to his human rights abuses as he plundered the nation’s wealth. It was this rampant nepotism and lack of accountability that would bring Charles Ghankay Taylor, initially a member of the Doe government until he was forced to flee the country due to allegations of embezzlement, into contention with the regime. A thoroughly researched historical account of a nation on the cusps of redefining itself and its narrative, Colin Waugh brings to the fore, the complicated domestic affairs and regional and international interference which set Liberia on a path that would see the destruction of its infrastructure and weaken its economy. More fascinating is Waugh’s ability to piece together the impact of Taylor’s, years in government and how it shaped Liberia and the ensuing civil war inSierra Leone. In order to successfully get rid of the Doe government, Taylor understood the dynamics of war. He and his NPFL (National Patriotic front of Liberia) spent time inLibyaandBurkina Fasoreceiving military training. In Sierra Leone, an uprising was also taking place against the autocratic government of Siaka Probyn Stevens, led by Foday Sankoh’s RUF (Revolutionary United Front) and known for its gruesome amputation of limbs. While Waugh acknowledges in his book that ‘working conditions improved for many living in the Taylor controlled ‘Greater Liberia’ though the puppet government in Monrovia was hemorrhaging economically, it is Taylor’s role, especially where ‘blood diamonds’ and support for the RUF is concerned that would later lead him to the International Criminal Court (ICC), in The Hague, where he became the first African head of state to face the court. A bold offering from Waugh because he takes the reader on a journey that is historically astute but never once loses sight of those who have suffered the most, the citizens of the land. 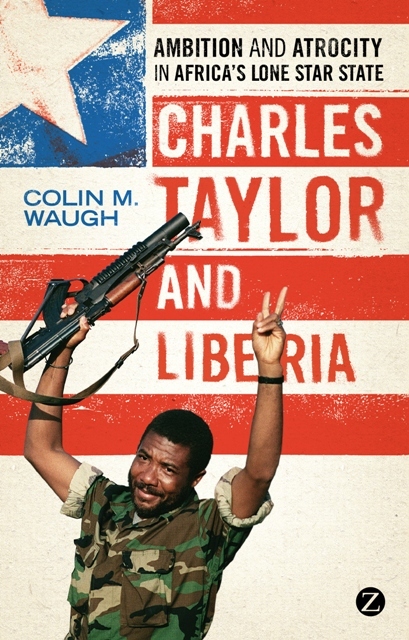 Charles Taylor and Liberia: Ambition and Atrocity in Africa’s Lone Star State is an illuminating and insightful examination of greed, corruption, war and violence, and its ravaging effect. Never has the horror of war being so vivid on a page. This text should be a compulsory read in African schools. Waugh leaves you wondering if Liberia is a victim of history as it is a victim of the external forces involved in its national affairs. This entry was posted on Wednesday, September 12th, 2012 at 11:30 pm	and is filed under Africa, African Diaspora, Book Reviews, Journalism. You can follow any responses to this entry through the RSS 2.0 feed. You can leave a response, or trackback from your own site.